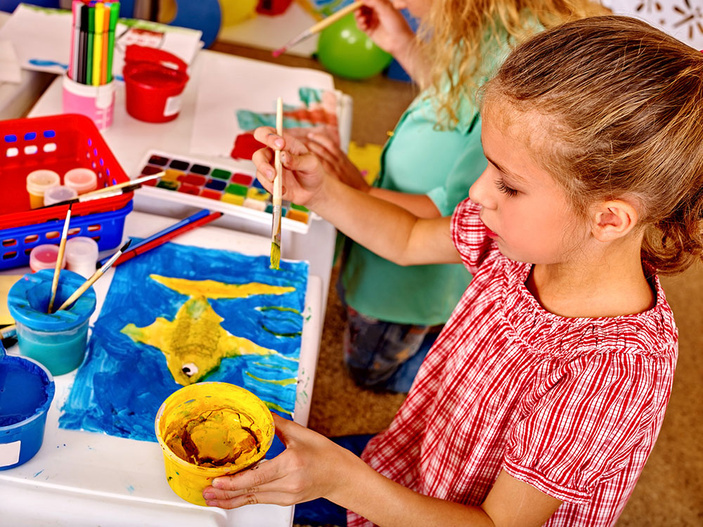 Family Art Time is one of the most popular programs at the Art Center of Corpus Christi, with everything you need to create a fun project. The Art Center in Corpus Christi is a fun, educational destination for the whole family. With monthly rotating exhibits, classes and workshops and activities for the little ones, the Art Center is an exciting place to spend an afternoon or an entire day! The Art Center is a nonprofit organization and was established to promote all types of arts within the community. Both local and regional artists exhibit their work for sale in the Art Center. Exhibits change monthly, so stop in frequently to see what’s new! If you want to make your own art, sign up for one of the Art Center’s varying classes and workshops. There’s something for everyone, as the classes range from watercolors to advanced pottery and everything in between. The Art Center of Corpus Christi is an integral part of the art community and beyond. It hosts a weekly farmers market, an annual Arts Alive! celebration, the free Family Art Time, and more. The Art Center’s most popular program is the twice-weekly Family Art Time, which serves over 10,000 people each year. The program brings families together to create fun projects. Participants are provided with all of the supplies and instructions so that each person can create an individual piece of art. Also a great venue for weddings, conferences or parties, the Art Center can be rented out to make your next event extraordinary. The building is one of the Coastal Bend’s most architecturally beautiful and is sure to set the perfect scene. The Art Center is located at 100 N. Shoreline Blvd. in Corpus Christi. For more information, contact (361) 884-6406 or visit artcentercc.org. Admission is always free, so take a break from the mundane and stop by the Art Center today!